FLASH WAR is over, and our favorite heroes are picking up the pieces…or at least, they are trying to pick up the pieces. Barry has to try and figure out these new forces that exist alongside the Speed Force. Young Wally has to figure out his place in the world. And older Wally…is in the race of his life! There are TONS of meta references in this issue as well. Want to know more? Follow us after the jump! 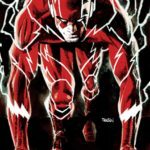 This entry was posted in Reviews and tagged Commander Cold, Flash War, Iris West, Kid Flash, Review, The Flash, Wally West on July 25, 2018 by Ed Garrett. 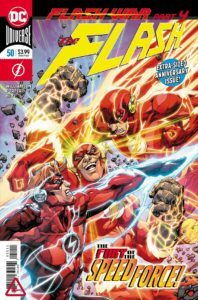 DC has posted the official six-page preview for this week’s issue of The Flash, and you can read it at Den Of Geek. 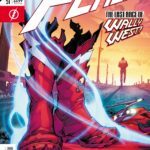 It’s part of the fallout from “Flash War”, which ended last issue, and features Iris worrying about Wally’s well-being and reminiscing about his life thus far. The variant cover is below. This entry was posted in Flash News and tagged Preview, previews on July 23, 2018 by Lia. 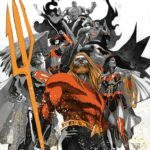 DC has released their full complement of solicitations for October 2018, and here are all the ones relating to the Flash. 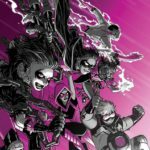 You can see the solicits in their entirety at CBR. Things are about to get hot—very hot!—when Flash has to battle fire monsters generated by his longtime nemesis, Heat Wave. Unfortunately, the pilot light blew out in Mick Rory’s head, because he’s comatose from the effects of the Sage Force! 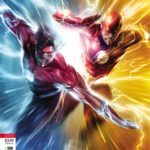 How can the Scarlet Speedster reach his old frenemy and get him to put out the fire monsters? Looks like Commander Cold takes a demotion…so he can pretend to be Captain Cold and talk Heat Wave down! In this volume’s “Sins of Youth” epic, the machinations of the covert organization known as the Agenda affects the team’s respective ages—leaving some heroes grown to adulthood and others reverted to adolescence! 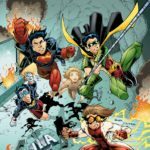 Collects YOUNG JUSTICE #18-19 and the SINS OF YOUTH titles JLA JR. #1, AQUAMAN/LAGOON MAN #1, BATBOY AND ROBIN #1, KID FLASH/IMPULSE #1, STARWOMAN AND THE JSA #1, SUPERMAN JR./SUPERBOY SR. #1, WONDER GIRLS #1, THE SECRET/DEADBOY #1, SUPERBOY #74, SINS OF YOUTH #1 and SINS OF YOUTH SECRET FILES #1. 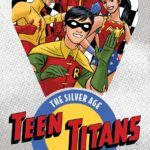 Collected for the first time in trade paperback, these stories pit our teen team against Captain Rumble, the Mad Mod and other far-out foes. 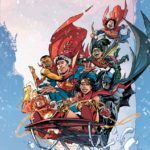 Plus, the classic tale “A Christmas Carol” is reimagined as “A Christmas Happening.” Collects TEEN TITANS #12-24 and THE BRAVE AND THE BOLD #83. Lex Luthor plans to bring war to the Garage, so the gang rides out to assemble an army. Natasha Irons is determined to save her world, but sending so many of her friends away on missions leaves her alone with Barbara…and the Batman. Can she defend the Garage against the first of Luthor’s meta-human League: the Flash? Plus, meet the founder of the Garage, Black Canary! Collects issues #7-12. This entry was posted in Flash News and tagged Solicitations on July 23, 2018 by Lia. It’s San Diego Comic Con weekend, and as always, Saturday is the day for major media presentations. 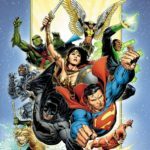 DC released trailers for Aquaman and Shazam today, and showed trailers for all of its CW superhero shows. You can see the teaser-trailer for The Flash series right here. As you can see here, we get an old-school Flash ring in the teaser, and a very good look at young Nora Allen. She’s called XS, which is obviously a nod to Barry and Iris’ superhero granddaughter in the comics; here she’s their daughter (or at least says she is). We also get an extended look at a villain, who is apparently Cicada. You may recall him as a villain from the Geoff Johns era, and he’s got his lightning-shaped knife in the teaser. He will be played by Chris Klein (American Pie) this season. What did you think of the trailer? Did it catch your interest, and are you looking forward to Cicada or XS? Feel free to share your thoughts! This entry was posted in Media and tagged Flash TV Show 2014 on July 21, 2018 by Lia. DC has released the official preview for this week’s issue of The Flash, which you can see at Nerdist. 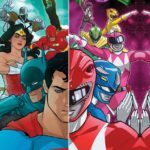 The preview’s a bit longer than usual (seven pages instead of five), presumably because it’s an oversized anniversary issue. 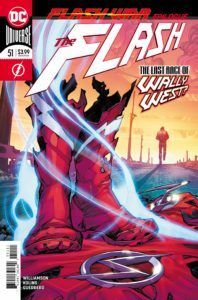 It’s also the final part of “Flash War”, although the next issue will apparently have some more fallout from the story. Check it out at the link! 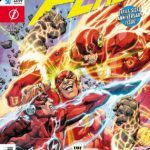 The lightning-fueled finale of “Flash War”! Zoom adapts two new Speed Force powers into his arsenal against both Barry Allen and Wally West. What are these strange new powers? What can they do? And how will this haunt the Scarlet Speedster long after “Flash War” is over? It’s the power of two Flashes pitted against the seemingly unstoppable Hunter Zolomon! This entry was posted in Flash News and tagged previews on July 9, 2018 by Lia.